We’re used to seeing exciting new internet companies going global either instantly or not too soon afterwards. The on-demand economy – companies offering everything from taxis to food to laundry services fast – will take a long time to reach anywhere near the same ubiquity. This is the first generation of online businesses whose expansion is routinely constrained not only by traditional factors like government-made laws but by the laws of physics too. The problem is that there are just too many pesky atoms involved – too much of the physical world. Uber has been able to scale around the world relatively quickly thanks to the huge amount of venture capital it’s raised but there’s not enough cash, or investor appetite, out there to fund contenders in every on-demand vertical to the same heights just as quickly. When Amazon Prime Now launched in my area a few weeks ago, there was frustration expressed by my friends who live in the city center that one-hour delivery wasn’t available there, when it would be an obvious place in which for it to be offered. Amazon one-hour delivery is constrained by factors like warehouse location and traffic patterns. The likely reason for this is that the fulfilment center Amazon uses for Prime Now is in a suburban area to the West of the city center and traffic has been worse than ever in recent months – it’s probably just too risky for Amazon to guarantee something will turn up within an hour in the middle of the city. Then there’s on-demand food. I can order a burger, pizza or curry from one of the many nearby takeaways via Just Eat or Hungryhouse, but Deliveroo, which offers a more adventurous selection of cuisine from local restaurants, isn’t available. It keeps its delivery areas small so that it can get food to your home hot and in good condition. I don’t live really close to any restaurants, and I’m about a mile outside of Deliveroo’s service area. Frustrating for me, and it’s down to those damn atoms again. Then there’s staffing. On-demand startups have fluctuating staffing requirements to fulfill their orders with a fast turnaround. Yesterday I wrote about BuzzHire, a kind of temp agency aimed at supplying on-demand staff to the on-demand economy. 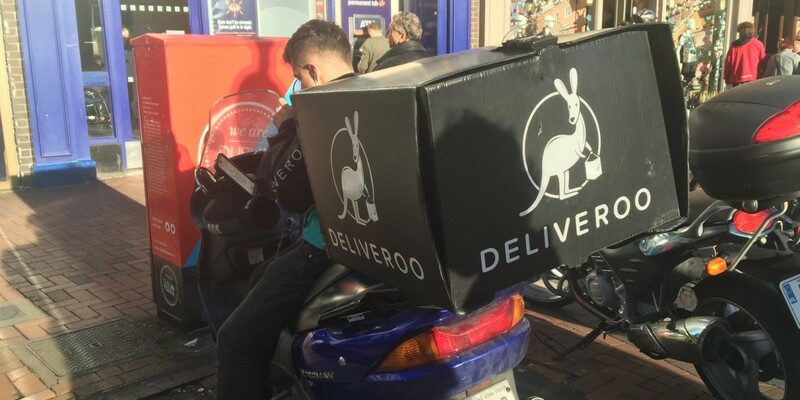 Even it has constraints on expansion – it needs a huge number of staff on standby in order to be trusted as a reliable source of staffing when things get busy for a company like Deliveroo. News that Uber’s own UberRush delivery service will be taking care of same-day deliveries for other companies like Nordstrom, T-Mobile and Google points at where things may be going – shared infrastructure used by multiple companies. This would see companies like Uber and BuzzHire offer the on-demand delivery capacity for others to use. We’ve got close to this before. Shutl, a UK company that was launched to power such infrastructure, was acquired by eBay in 2013. eBay then shut down its one-hour delivery operations down last year. We could go further than on-demand service companies, though. Nathan Rae, a member of the tech community where I live in Manchester, has long discussed the concept of a Physical Package Protocol, where a drone would move a package a short distance before passing it to another for the next leg of its journey. A network of drones would be set up to cover a grid of short, fixed, point-to-point journeys. In theory, this would make moving deliveries around more efficient and require fewer vehicles and staff for a ubiquitous on-demand economy to work. We’re a long way from that, but eventually we’ll figure out a way to make the real world work efficiently enough for on-demand to become the norm for most people. And then maybe I can get a nice hot Deliveroo meal delivered without having to move house.